Creating 180 Degree immersive experiences is no small task. Our client needed full body green screen interviews of Tulane University’s leading members captured, from the dean to key personnel. Those who are leading the way to advancements in education and technology. We were there to provide content that would be implemented into Tulane’s immersive show. It would be used alongside a variety of features, telling the story of Tulane’s continuing push to lead the way in educational institutions. The entire display was great! Implementation of the green screen interviews was to engage audiences; furthermore, to describe their roles along with the latest developments within their departments. Feature stories surrounded the room telling of overcoming disasters such as Katrina and the magnitude of ways Tulane is providing opportunities to the community such as New Orleans’ GrowDat Initiative. Tulane’s outreach is setting trends, which has resulted in other educational institutions taking notice. Teaching is at the basic level of what universities provide. Reaching students and developing communities has set Tulane apart, not only educationally, but also inspirationally. Great music is one thing, but great people behind the music is what harbors creativity. 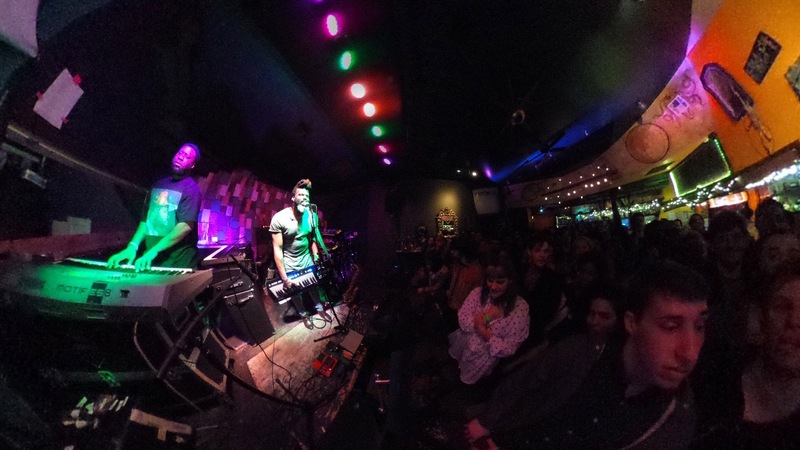 We were fortunate to spend time with all of the musicians and team behind the Robert Glasper Experiment. The Grammy Award winning artist breeds creativity. It was such a privilege to not only witness, but also capture the creation and development of their upcoming album. Music in New Orleans is engrained in & essential to our culture. The world’s most talented musicians travel to new orleans to create & become inspired. We love the opportunity to visually represent the experience of music. The creation of it, the feel of it, the impact of it, music has the profound ability to move us as people. From a simple note to the evolution of sound transcendence, this experience has been unforgettable! 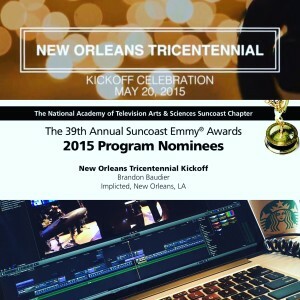 So, you’re looking to make your New Orleans corporate video production stand out from the rest? Maybe it’s to impress your staff, clients, or even your competition? Here’s the 5 things you have to make sure you follow when you begin this process. There is a fine line between being relatable and just plain pandering. You don’t want the corporate video you distribute to be the latter. Instead of going for the cliche in New Orleans corporate video production themes (Mardi Gras, second line), pull a story from the community. A story that relates to your company in a positive light. Even taking an employee or manager and giving them the spotlight will help more people connect to your company. This prevents them from zoning out when they see the same visuals they always see. Producing small vignettes that depict a person or highlight a current company campaign can be extremely memorable for many companies. If you only have one specific type of customer, that might help your targeting… but what about expanding beyond that demographic? The best way of ensuring the longevity of your company is thinking about the long-term goals. Before you begin your foray into any New Orleans corporate video production, be sure that you have plans solidified that appeal to the different kinds of customers. 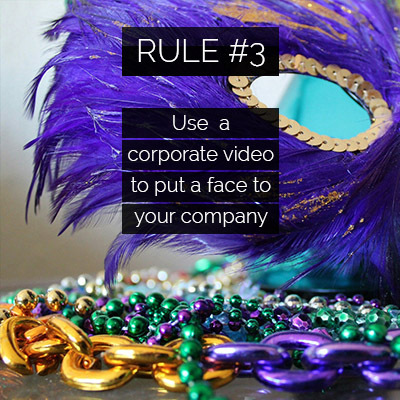 Much like how a Mardi Gras mask is the “face” of New Orleans Mardi Gras, your video can put a face on your company. Much like how a Mardi Gras Mask is the “face” of New Orleans Mardi Gras, your video can put a face on your company. Much like how a Mardi Gras mask is the “face” of New Orleans Mardi Gras, your video can put a face on your company. Whether it is the CEO, an employee, a customer, a local celebrity, even a mascot, having a face or symbol to put with your company will make you more recognizable and relatable. The goal for any video production company should be creating content that helps connect the business with the client on a personal level. Having a story or face connected with you will aid in brand recognition. Having a strategy or purpose in mind with your video is going to be the key. Are you trying to gain more customers, appeal to potential employees, attempting a company rebranding effort? Maybe you’re just in crisis mode? Working with the right video production company can help you realize these objectives. This will help to make your video as effective as possible. Not to mention, having a budget in mind helps your production company give you realistic expectations. Static is never a word you want describing your company or the materials you put out for others to see. We recommend videos use movement to keep your viewers entertained, interested and engaged throughout the experience. Keep your story moving through dynamic cinematic visuals, things that keep both the eye and the mind moving toward your final conclusion. Moving the camera brings movement to your story, keeping it fresh and modern. In need of Corporate Video Production? Call 504-298-8323 or send us an email and we’re happy to start the conversation with you. implictedSTUDIOS has a variety of production projects available. Check them out on our Work page! Providing video content is one of the best ways to market your business or service in 2016. Video content is king and not utilizing it just isn’t smart business. Look to the success of popular apps such as Vine, Snapchat and Instagram if you need convincing. People are more interested in watching movies and television than ever before… and of course we can’t forget the all-powerful YouTube. YouTube has over 1 billion users around the world transforming the atmosphere of video. It is easier to grab someone’s attention with video. You can send more information through this medium than you can in an article. In today’s video saturated market, going “viral” is always a goal. In large cities like New York, Los Angeles, and New Orleans there are many production houses. Before you agree to work with one of the many New Orleans video production companies, ask these critical questions. 1. What kind of videos or film to do you usually produce? Every artist has their preferred medium and video content producers are no different. Some like to work with event filming, while others prefer corporate or commercial video productions. To help you decide if a video producer is the right choice for your project, learn what style they prefer. 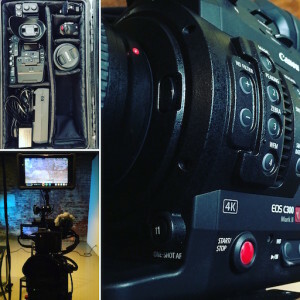 There are several New Orleans video production companies but not all can accommodate your project’s goals, vision, or budget. They may not have the equipment, the experience or the time. Discussing this first will save you time, money and frustration. 2. What does your recent work look like? This question is critical to ask before agreeing to work with any video production company. And we say judge a company based on their recent work. Every company has growing periods and makes mistakes, video production companies are no different. Video content is an ever-changing creative medium.. technology changes, styles change, and every aspect in the creation of video content evolves as time progresses. It is our job as a company is to stay on top of that evolution and at the forefront new innovatoins. Instead of judging a company based off a project from 5 years ago, ask about their recent work and clients. You can call and check references. but actually view what their most recent works have been. This will provide better insight of what kind of style and aesthetic they use in their projects. 3. What is your vision for this project? It should go without saying, but we will mention it for safety sake. Always ask a video production company what their vision is for the project you are sharing with them. This is important for two reasons. First, the company likely has experience with a similar type of project and can help you to visualize the final product. Two, they can give you a better idea of what they are capable of creating within your budget. If you are responsible for finding a reputable video company, this kind of help and influence is crucial in creating a great product that exceeds you’re vision and goals. Looking for the right creative video studio to help you take your idea and bring it to life? Contact implictedSTUDIOS and let’s get to work! Give us a call at 504-298-8323 or say hello via email and we’re happy to build your story with you. 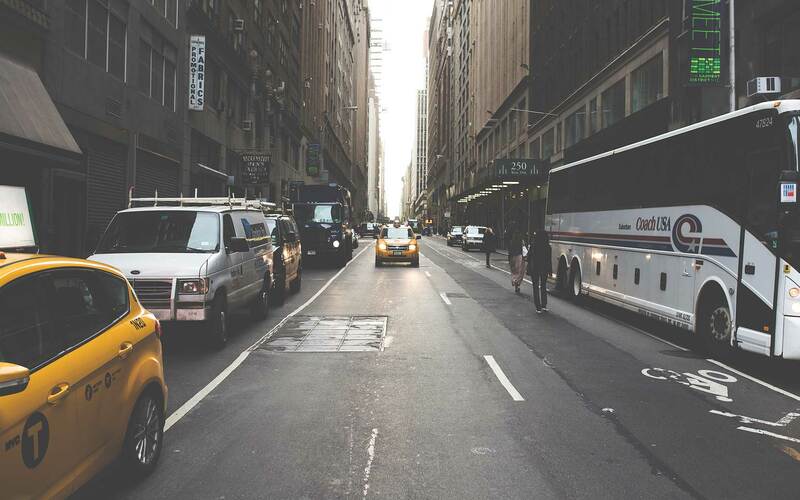 There are many wonderful cities the United States, but we believe people come to this city for the creative culture. Musicians, artists, actors, and filmmakers all come to New Orleans to take part in the city’s spirit of mystery and history. 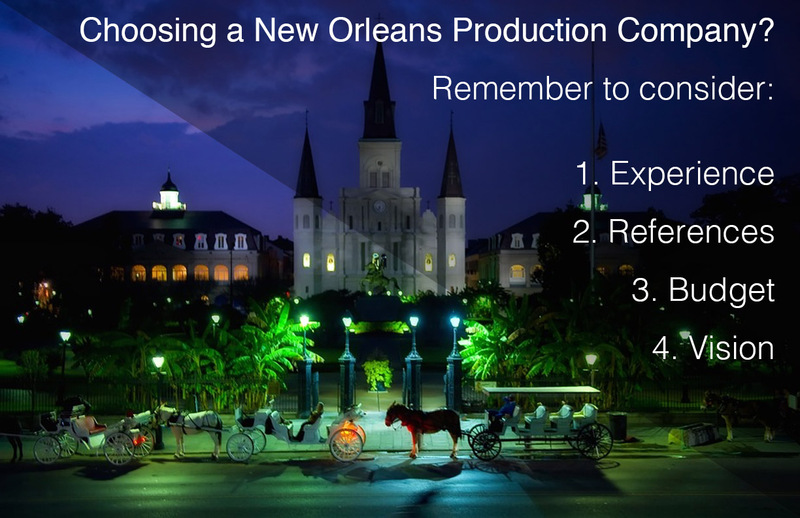 Here are a few things you should know if you are looking to use the various production companies New Orleans has to offer. One of the best ways to learn the quality of the different productions companies New Orleans uses is to look at a few different things. Factors such as their previous work, past clients and how they resolve problems and provide solutions. See what kind of projects they have created, how long have they been working professionally, and the extent of their experience . When we mention experience, it doesn’t just mean length of time but what kind of problems have they run into and how have they figured them out? Have they worked with larger or smaller companies? Can they manage large crowds, permits, legal issues and the like? Knowing these things will help you decide on the right production company for you. When we suggest checking references, we don’t mean call their former clients. We mean take a look at their recent work and past clients. You can see some of the projects we’ve worked on at ImplictedSTUDIOS Work. Perhaps you would like to take something from that project? Or make sure that you stay away from that style altogether? Instead of just taking personal references or calling the first company you can find, do your research. Some production companies only work on television or movies and that might not be what you need. It will help make the process smoother and more cohesive as it progresses. There are many different production companies that call New Orleans home. Each one has a different skill set that they bring to the table. As with any kind of service comes a price. It is up to you to give the production company that information so that they can plan accordingly and hopefully, exceed your expectations without exceeding your budget. Many variables go into what can be afforded with each project, from gear selection to number of crew members and production development… Providing a budget helps a production company to plan what is necessary to create that perfect final product. Every video production company has their own unique vision for any project and it doesn’t hurt to take an ear and listen. They can foresee potential problems or offer helpful suggestions that will help improve the final product. Discussion is key to a collaborative and successful endeavor. So take the time and make sure it is exactly what you want and need. Client and company collaboration is what creates memorable and effective products. With any project, a professional production company’s main goal is that the client and their own vision, aligns. If you don’t feel this kind of mutual respect with a production company, keep looking for one that listens and guides you. Our company is here to support our client’s vision with our experience. Ready to see what we Implicted’s vision can do for you? Give us a call at 504-298-8323 or say hello and we’re happy to build your story with you. Why So Much National Buzz Around Louisiana Film Production? In the past few years, dozens of companies have been traveling from the usual cities like L.A. and New York to use Louisiana film production services. But why now, and why Louisiana? Louisiana is at the forefront of the expansion of the film industry. 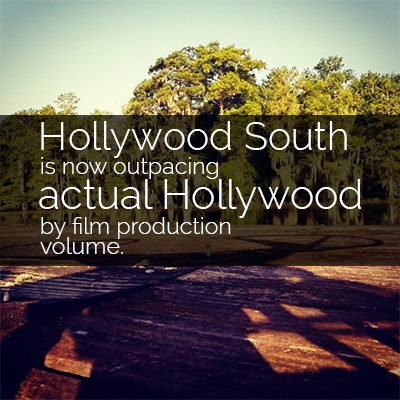 Known as “Hollywood South” Louisiana exceeded California in film and television production for the first time in 2013. The reason? There are several. In 2002 the state passed the Louisiana Motion Picture Incentive Act. This tax incentive that allows up to 40% transferable tax credit on production expenditure. These tax credits offset personal or corporate income tax liability in Louisiana. Then they’re returned to Louisiana taxpayers. The act also states that to qualify for a maximum tax credit, they must hire local labor. This entitles them to a 10% tax credit for payroll expenditures on Louisiana residents. This encourages productions to use Louisiana residents in their projects. Thanks to this innovation, New Orleans will be soon be home to largest film industry studio in the Southern U.S. In 2014, Deep South Studios announced that they would be building a $63.5 million movie production campus in Algiers, a New Orleans suburb. With this kind of construction, New Orleans is sure to become a leader in the American film industry. Besides the tax incentives, there are various reasons why companies are traveling south to take advantage of Louisiana film production. The warmer weather throughout the winter months and Louisiana’s variety of landscapes help to provide more options for location shoots. In essence, they can film in Louisiana but make it appear as if they are in almost any other location. Not just that but the Louisiana film production industry has always been present within the state thanks to institutions like the University of New Orleans film school program as well as the 26-year running New Orleans Film Festival. There have always been talented film makers in Louisiana brimming with creative ideas. Not all are looking to create multi-million dollar productions but they still enjoy the process of taking an idea and making it a reality for other ventures like corporate videos, commercials and music videos. Louisiana has been home to many successful productions including: the Twilight Saga films, Oscar-winning Dallas Buyers Club, 21 and 22 Jump Street, both Pitch Perfect films and Jurassic World. A few notable productions that are currently filming in Louisiana include, Bad Moms starring Mila Kunis, Kristen Bell, and Christina Applegate, Jack Reacher: Never Go Back starring Tom Cruise, and the television show Scream Queens starring Emma Roberts and Jamie Lee Curtis. Not to mention popular television series that have filmed all over Louisiana such as True Blood, True Detective, and American Horror Story. So no need to ask why companies are traveling to Louisiana film production. Rather, ask “why not?” With tax incentives that benefit not only the filmmakers, but create jobs for Louisiana locals, landscapes and locations that take your breath away, as well as dedicated and creative residents, Americans will be seeing a lot more of Louisiana in the coming years. We love working with clients from all over at implictedSTUDIOS! We look forward to hearing from you, via phone (504-298-8323) or email. 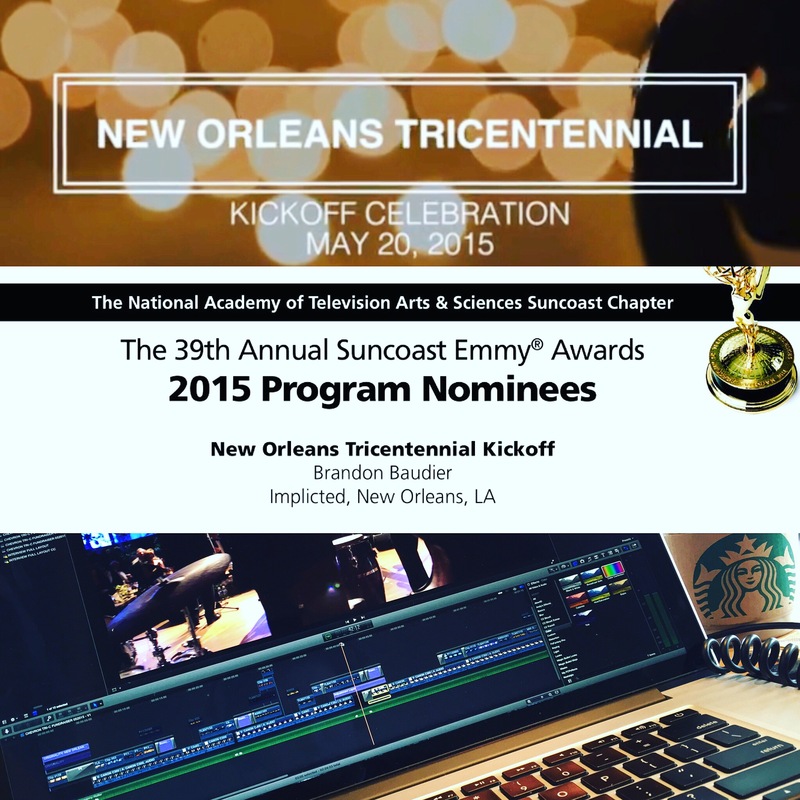 Congratulations to our team at implictedMEDIA for being nominated for a 2015 Suncoast Emmy Award! We are very fortunate due to the fact that we have a team of creative individuals that allowed for this accolade. Our approach to each project is to create the best product within our client’s means. We strive to provide all the necessary creative tools at our disposal, thus allowing us to tell visually compelling stories. Moreover, an enormous amount of gratitude goes out to our client for this project. They allowed us to do what we pride ourselves on… capturing moments and create stories to engage audiences. Our versatile team on this project includes Brandon Baudier, Andrew Alvarez, Mickey Gaidos, and Brighton Linge. 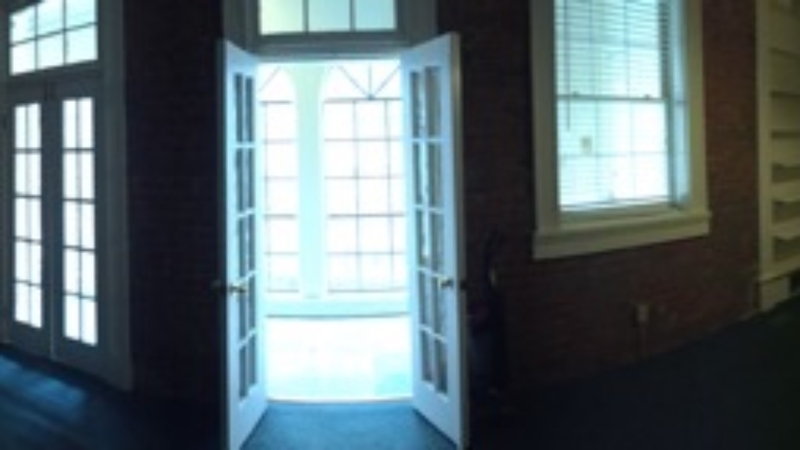 After two years at the office on Lafayette Street, we’ve moved to a larger space down the street on St. Charles Avenue. The new space comes with client viewing/seating, an elevator, and conference rooms. New location, equipment, projects, blog, and partners… A plethora of updates are on the horizon. Let's meet for coffee and conversations. Inquiry? Quote Request? Just Chat About Your Project?